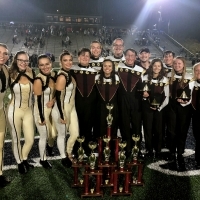 The Tennessee High School Mighty Viking Band (MVB) announced today that the band brought home numerous trophies from the Land of the Sky Band Competition in Enka, N.C. by sweeping the class 3A Category. The highly competitive band competition featured more than 30 bands including two exhibition only bands. The MVB competed in class 3A and won first place for color guard, drum major, percussion, music and first in class 3A. Not only did the band sweep their division, but the band scored third overall in the day behind two of the largest bands in larger classes and scored higher than some larger bands over all. The MVB will host the Music in the Castle next week on October 6th, in the Stone Castle in Bristol, Tenn., Doors open at 9 am on Saturday. Music in the Castle will feature 25 competing bands and three exhibition bands.